As consumers and businesses demand more control and detail in the products they buy, and with industry always requiring more precision and efficiency, the machines used to create the things we need become more complex by the day. But more often than we realize, it’s the simplest things that can do the most for us, and this is the principle behind one of The Foam Factory’s most precise and efficient machines: the waterjet cutter. The original concepts for water cutters were only able to produce short bursts of water, with pressures far less than what is standard today. Since then, the capabilities of the machine have grown to be able to generate constant streams of water at pressures of 60,000 psi and greater. Of course, the technology required to generate that kind of power is substantial, but the core idea behind the first machines remains the same – that the power of water can be used to break down the strongest materials. There are two types of waterjet cutting machines; pure water cutters and cutters that utilize abrasive additives. As the extent of The Foam Factory’s cutting is open-cell foam and closed-cell foam like neoprene and polyurethane sponge foam, abrasive waterjet cutting is not needed. The machine is compatible with abrasives after the switching of a few parts, though the jobs and materials The Foam Factory handles aren’t the types that require the additional cutting power abrasives provide. Industries that work with metals, wood, and very thick materials do utilize abrasive cutting however, and do so with precision. 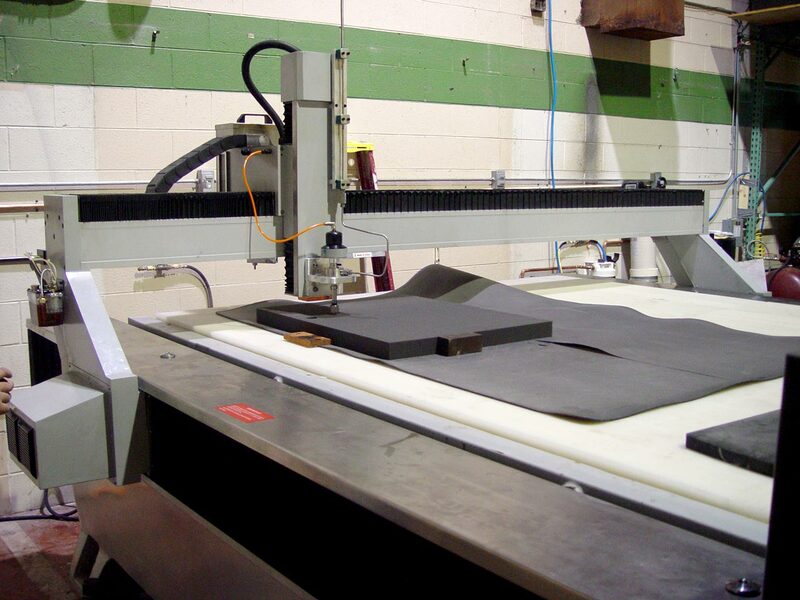 Unlike most saws and cutting machines used in foam fabrication and manufacturing, waterjet cutters are able to make cuts within the interior of a material without entering from the exterior. This is done by stopping the flow of water which ends a cut, moving the nozzle position to within the interior of the material, and resuming cutting. 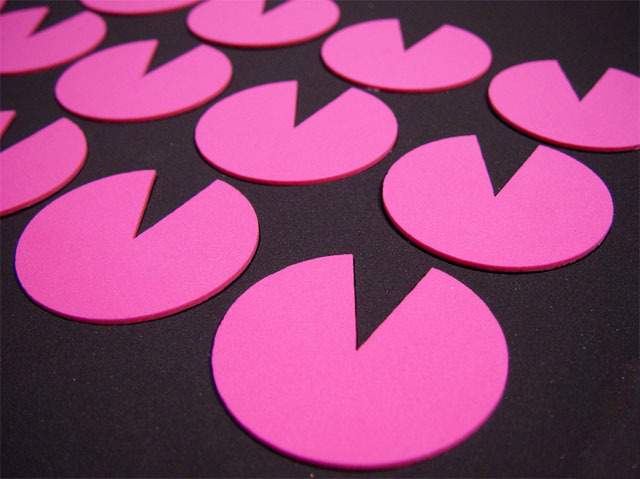 For things like foam gaskets or conceptual prototypes that require a consistent outer edge with cutouts inside the shape, waterjet foam cutting is a smart choice. Waterjet cutters are computer programmed, which eliminates the need for molds and plates that other cutting methods require. But while this limits the practicality of large-scale jobs, it makes short or single-run jobs and even prototyping affordable and efficient, as it eliminates the cost and lead time of creating dies. When customers are able to provide programming files for projects, small-run jobs can be produced in as little as an hour from programming to the final cut being made. The same project could take weeks on machines that utilize dies and molds. The speed with which waterjet cutting machines are able to complete jobs is matched only by their precision. With pure water cutters like The Foam Factory’s, the diameter of the stream of water can be as small as .005 of an inch. For perspective, the thickness of a single sheet of typical 20LB copier paper is about .004 inches. This stream allows intricate angles, smooth curves, and straight lines to be cut into a material with a degree of precision almost impossible to replicate by the human hand. When considering a waterjet machine is able to replicate those exact designs hundreds of times over, it becomes virtually impossible to match its capabilities by hand, and surely not in the same amount of time it takes the machine. And with a 10 foot by 7 foot table, The Foam Factory’s waterjet cutter can work on very large sheets of foam, maximizing efficiency. Because of the nature of the foam rubber and sponge materials The Foam Factory cuts, their particular waterjet is only run at 45,000 psi, or about 75 percent of full power. Still, the 7 inch thick blocks of corrugated plastic used to raise and hold sheets of foam are shredded by the machine over time. The blocks are small enough that they can be flipped, rotated, and re-organized to different areas of the cutting table to maximize their life, however. That said, with the reduction of power and these life-extending measures in place, if the machine were run 40 hours a week, the corrugated blocks would be rendered unusable in approximately one year. So while it may take fairly complex machination to produce results, the waterjet cutter is still based off one of the simplest ideas in nature – that water can erode and break down solids – reminding us that sometimes our smartest technology can be rooted in the most basic of principles.